If you don't have ginger powder, just shred a fresh rhizome. That's by the way what the researchers did, as well. Yeah, we all know "Ginger is good for your glucose metabolism". We all know "there are dozens of rodent studies that support it's benefits". And we also know that there is evidence from acute interventions that indicate that ginger can ameliorate the glucose response to oral glucose tolerance tests. But do we know, whether the regular consumption of realistic amounts of pure ginger will have beneficial effects on the glucose levels of those who would benefit the most, i.e. type II aka "lifestyle" diabetics? The results of the latest study from the Tehran University of Medical Sciences where scientists obviously don't depend on being able to produce patentable agents would suggest: There are benefits! I have to admit, though, the ginger the 20-60 years old diabetics consumed was not provided in form of whole roots, but rather as a powder made of ginger roots. Patients were divided randomly into two groups (experiment and control, 25 subjects in each) using computer's random numbers to receive either ginger or placebo one capsule twice a day for 12 weeks. All subjects were permitted to consume their usual medications according to their physician's recommendation. Regular ginger powder, nothing else! The fresh rhizomes for the ginger powder purchased from local market and were ground as a fine particle after drying. The powder was delivered to a pharmaceutical lab (Tehran university of medical sciences, Iran) to prepare capsules containing 1 gram ginger in each. Lactose was also used to make placebo. Information on when the supplements were ingested is unfortunately, not available, but I assume "twice daily" means with breakfast and dinner or something like that. 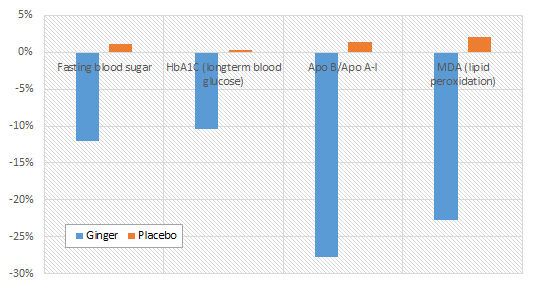 Figure 1: Changes in fasting blood sugar, HbA1C, Apo-B/Apo-A1 and MDA levels (Khandouzi. 2015). What is available, is the most relevant information, i.e. glucose, apolipoproteins and MDA levels we can use to access the effects on glucose and lipid metabolism and the peroxidation of polyunsaturated fatty acids. Warning: Don't throw away your diabetes drugs. While the study at hand is impressive, only metformin, not gingeris a standardized, tried and proven blood glucose medication. No one can guarantee you will see the results in the study at hand with ginger powder you buy on the Internet. So, if you want to try to add Ginger to your regimen and take a look at your blood glucose levels. If possible talk to your doctor and reduce your meds. By no means, however, replace them by ginger from one day to another! Overall, there is thus little question that something as simple as adding 2g of pulverized fresh Zingiber officinale rhizomes will have a significant impact on important health markers in middle-aged type II diabetics. 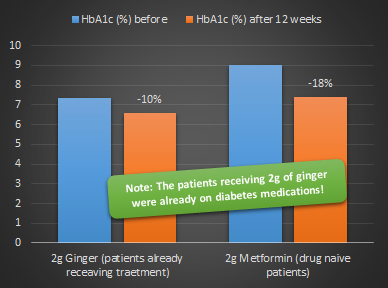 Comparison of the HbA1c reduction in response to 2g of ginger powder made from fresh rhizomes (Khandouzi. 2015) and 2g metformin (Schweizer. 2007) in two different populations of type II diabetic patients. One already on meds, the other medication naive. 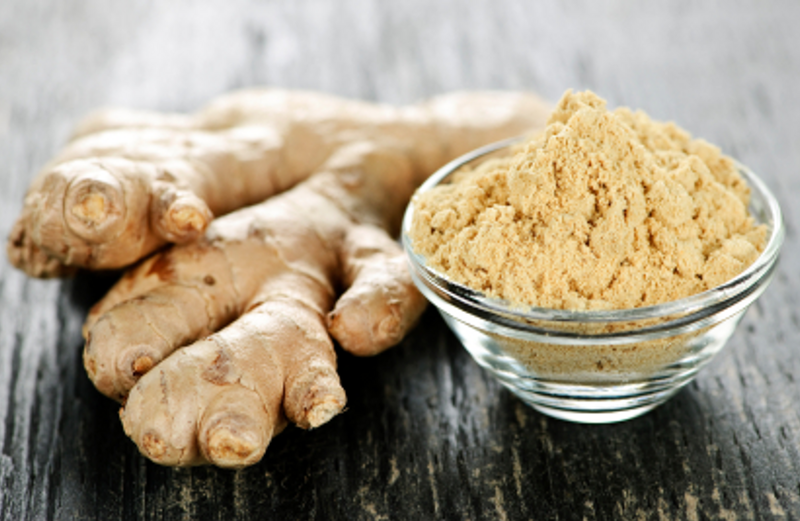 Bottom line: The data from the study at hand suggest that for type II diabetics, ginger powder is a "must have" supplement. Why? Well with 10% the reduction in HbA1c is only 8% smaller than the reduction Schweizer et al. observed in their 2007 study with metformin the hailed "holy grail" of diabetes treatment where the addition of metformin a drug many of the subjects in the study already used lead to an HbA1c reduction of 18% within the first 12-weeks of the 52-week study. Impressed? Rightly so. I mean, the patients in the Schweizer study had higher baseline levels, but they were drug-naive, i.e. unlike the patients in the study at hand, they did not receive any diabetes treatment before the metformin therapy was initiated | Comment on Facebook! Khan, Mudassir Ahmad, and Abdul Baseer. "Increased malondialdehyde levels in coronary heart disease." J Pak Med Assoc 50.8 (2000): 261-264. Khandouzi, Nafiseh, et al. "The Effects of Ginger on Fasting Blood Sugar, Hemoglobin A1c, Apolipoprotein B, Apolipoprotein AI and Malondialdehyde in Type 2 Diabetic Patients." 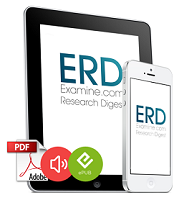 Iranian Journal of Pharmaceutical Research: IJPR 14.1 (2015): 131. Patel, Anushka, et al. "Intensive blood glucose control and vascular outcomes in patients with type 2 diabetes." (2008). Schweizer, A., et al. "Comparison between vildagliptin and metformin to sustain reductions in HbA1c over 1 year in drug‐naïve patients with Type 2 diabetes." Diabetic Medicine 24.9 (2007): 955-961. Van Stiphout, W. A. H. J., et al. "Is the ratio of apo B/apo AI an early predictor of coronary atherosclerosis?." Atherosclerosis 62.2 (1986): 179-182.